Does religion matter in global affairs? Had this question been put to social scientists of the 1950s and 1960s most would have answered a resounding no. Yet, the last three decades would tell us that religion really does matter. 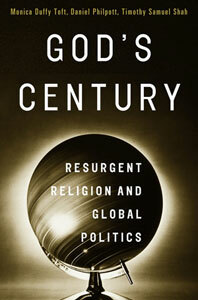 This is the case that God’s Century: Resurgent Religion and Global Politics makes and does so in a very compelling way. Authors Monica Duffy Toft, Daniel Philpott, and Timothy Shah came together to argue that religion matters and prove that by analyzing its role in a variety of different areas. All references in parenthesis refer to the locations in the kindle version of the book available here. God’s Century is not the first book to make this case but is a valuable addition alongside works such as Elizabeth Hurd’s The Politics of Secularism in International Relations, Religion and International Relations Theory edited by Jack Snyder, and The Price of Freedom Denied by Brian Grim and Roger Finke. We have addressed this topic on e-IR in our publication The Sacred and the Sovereign. All of this literature points to the fact that religion is an important element that needs to be understood by states and international actors in the 21st century or – as the book labels it – God’s Century. Launching the book, Timothy Shah said that despite all of their formal academic training at some of the best institutions in the world, this did not prepare them, and may have actually been detrimental, for understanding how religion impacts global politics. The opening chapters address the secularization thesis that was dominant through the 1960s but in reality “has proven a poor guide to the global historical reality.” Rather than the number of religious adherents shrinking it has increased. The percentage of the world population that is an adherent of Catholic Christianity, Protestant Christianity, Islam, or Hinduism rose from 50 percent in 1900 to 64 percent in 2000. (173). This represents part of the argument but the book argues that it is not just the percentage of people who are religious that has changed but it is significant because their influence has also increased. “Once private, religion has gone public. Once passive, religion is now assertive and engaged. Once local, it is now global. Once subservient to the powers that be, religion has often become ‘prophetic’ and resistant to politicians at every level” (184). There has been a dramatic and worldwide increase in the political influence of religion in roughly the past forty years. The two factors that most influence a religious actors’ politics are: 1) political theology or set of ideas a religious community holds about political authority and justice and 2) the mutual independence of religious authority and political authority. Taking up the topic of religion and politics does raise some serious issues and addressing these is the purpose of the second chapter “Behind the Politics of Religion”. They delve into the seemingly simple but rather complex issue of “what is a religion” and the corollary question, “what is a religious actor.” They define a religious actor as “any individual, group, or organization that espouses religious beliefs and that articulates a reasonably consistent and coherent message about the relationship of religion to politics” (600). This also requires the important reminder that every religion contains political diversity. It is not enough to simply ask the religious affiliation of an individual and assume you understand their political stance as well. Thus, religious beliefs should be taken seriously but not treated as a monolith. After laying the theoretical groundwork the authors look at historical trends and technological developments that have led to religious actors exerting greater influence. The authors spend two chapters on the role religious actors’ play in violent conduct. They look at the “glocal” phenomenon of religious terrorism and then religion’s role in civil wars. The authors dig into the data and various examples to explain the roots of religious terrorism and why in 1968 there were no known religiously inspired terrorist groups and now they account for the overwhelming majority of attacks. When considering the religiously inspired violence terrorism typically gets more media coverage but it is also significant in civil wars as well. Based on a study of all civil wars since the 1940s those where religion plays a significant role are more deadly for both combatants and non-combatants, last on average two years longer, and are twice as likely to recur than those where religion does not play a significant role. Religious civil wars account for an increasing proportion of all civil wars, up from 19% in the 1940s to 50% as of 2010 (3272). Chapter seven takes a refreshing turn away from the violence of terror and civil war and considers religious actors as “Militants for Peace and Justice.” From Sant’Egido in Mozambique to Engaged Buddhism in Cambodia to the Catholic Church in Guatemala, in a number of instances religious actors have been crucial in negotiating peace settlements and post-conflict resolution and reconciliation efforts. Religion and politics does not necessarily equate to increased violence but can in fact be just the opposite. Jeremy Paul Barker has a B.A. in History and a M.A. in Cross-Cultural Studies. He is currently studying in Istanbul, Turkey for a M.A. in International Relations. His main focus lies in the convergence of religion and international affairs. J. Paul Barker is an Associate Editor of e-IR. He has a B.A. in History and M.A. degrees in Cross-Cultural Studies and in International Relations. His main focus lies in the the convergence of religion and international affairs.